This re-focused third edition of McGerveys Introduction to Modern Physics is one of the most comprehensive up-to-date textbooks and references sources on quantum mechanics available. This revision fills the gapbetween the mainly descriptive treatments of quantum mechanics, usually found in traditional modern physics texts, and the non-intuitive approaches that treat the subject as a series of mathematical theorems. McGervey achieves this goal with a thoughtfulanalysis of a number of experiments, supplementing these with fully worked examples, and by investigating paradoxes rather than relying on the analysis of a series of dry mathematical theorems. Software, provided with the text, is available for IBM-PC compatible computers with VGA graphics. The software is the basis for the homework problems, many of which have not been used in any form in other books at this level. 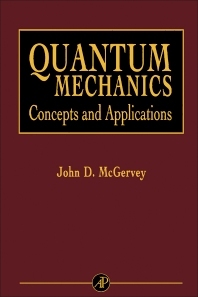 The text is exceptionally current, a fact reflected in the significant amount of materialbased on articles published in recent years in The American Journal of Physics, The Physical Review,<$> and Science.<$> In all, McGervey provides a lively discussion that will motivate interest and understanding of the subject at the senior undergraduate level. This textbook is useful for a senior-level course on quantum mechanics, which is taken by virtually all undergraduate physics majors. Also of interest to students in materials science or metallurgy (especially quantum statistics), chemistry (especially atomic, molecular and optical), and astronomy. The Quantum Concept. Waves and Particles. The Schridinger Equation in One Dimension. Further Analysis of One-Dimensional Bound Systems. The Free Particle as a Traveling Wave. Three Dimensions and Angular Momentum. Angular Momentum and Superposition of States. The Radial Schridinger Equation. The Hydrogen Atom. Spin. Identical Particles. Approximate Solutions. Atomic Spectroscopy. Time-Dependent Perturbations and Radiation. Molecular Structure and Spectra. Quantum Statistics. Appendix A: Probability and Statistics. Appendix B: The Boltzmann Factor. Appendix C: Relativistic Dynamics. Appendix D: Derivation of the Eigenfunctions of the L<+>2 Operator. Appendix E: Solution of the Radial Equation for the Hydrogen Atom. Appendix F: Numerical Solution of the Schridinger Equation. Appendix G: Stable Particles. Appendix H: Table of Physical Constants. Index.